Below are two articles, written by Alex Monro, a member of our congregation. 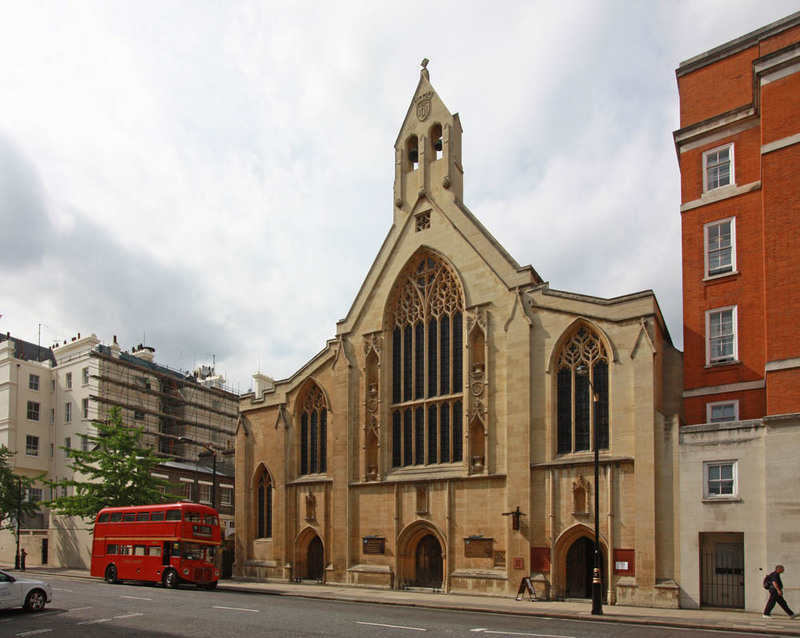 Holy Trinity church began its history as a chapel in the Knightsbridge area, attached to a leper hospital founded by Westminster Abbey, who to this day are patrons of Holy Trinity. In 1629 the chapel had become so dilapidated that a petition was made to Archbishop Laud, when he was Bishop of London, for permission to rebuild. . It was granted and a new building arose on part of the land currently occupied by the Parkside block of flats, just west of Hyde Park Corner. Laud gave a silver Communion Chalice, still owned by our church, now in the care of the Victoria and Albert Museum. Holy Trinity was a late addition to the churches in the Kensington area. In 1842, there were only three churches in the area of South Kensington, St Mary Abbots, Holy Trinity, Brompton and St Barnabas, Addison Road. 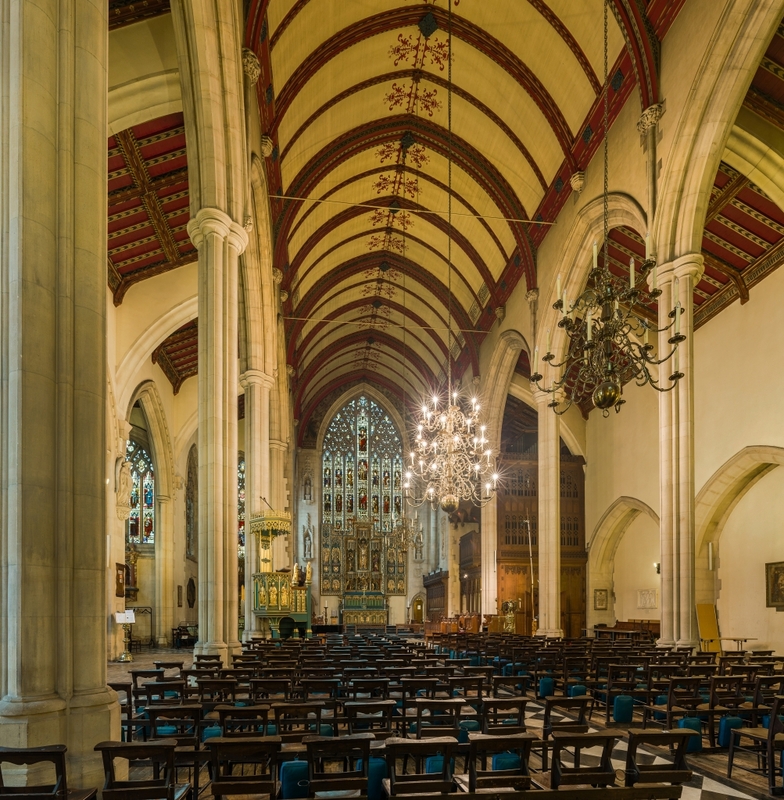 In the next 35 years, fourteen new parishes were established, the design and building of which involved many of the best Victorian ecclesiastical architects of the day. By the 1870s, most of these were completed. The move of Holy Trinity to Prince Consort Road nonetheless took place in 1901 where a site was found to the south west of the Albert Hall at that time just in Kensington and the new church was planned as Holy Trinity South Kensington. It still carries this title even though by 1901 the land had been ceded to Westminster in exchange for Kensington Palace, which at Queen Victoria’s behest had been moved from Westminster to Kensington. What is special about this building? Commissioning a church from the Bodley architectural practice often meant that you were going to get a church built in the 14th Century late perpendicular style. Holy Trinity Church is no exception. But it is the interior that is outstanding, perhaps one of the finest examples of Bodley’s work. The loftiness of its interior and the lavish fixtures and fittings almost transports one back to the decorative condition of churches before the Reformation. The tall slender piers of the nave and the wagon roof of the nave and chancel remind one of the great Perpendicular churches of the west country. Absolutely nothing is wanting, from the chequered marble floor to the statues filling the niches flanking the great east window. the choir stalls, the stained glass, the pulpit and the font are all designed by Bodley and created very closely to his original plans. After the death of Bodley in 1907, the work was supervised by C G Hare, his partner, who was also responsible for the design of the organ casing. Here then is a building of great wealth and most unusually for most town churches of that date, of great completeness. Even in its 14th Century Perpendicular style, at the same time it conveys an aura of the comfortable wealthy and confident years of the reign of Edward VII, with its pride in Britain and the Empire. It is a beautiful church, which is at the same time both a Gothic church and a church of its time. 1906 Lady Chapel and ‘North’ Aisle consecrated. Sacristy built by Mrs Coward in memory of her son. 1907 Death of Bodley. Vestries completed. 1912 Reredos installed to Bodley’s designs. 1955 All Saints closed to Anglican Worship. Douglas William Cleverley Ford appointed Vicar of Holy Trinity with All Saints Church. The Reredos above the High Altar is Holy Trinity’s outstanding feature, designed by Bodley with Lawrence Turner as his carver. It is a large gothic triptych, lavishly gilded and painted, with a multitude of carved figures under elaborate canopies. 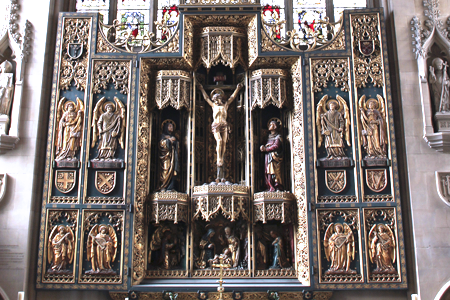 The reredos depicts the Crucified Saviour between the figures of the Virgin Mary and St John. On either side of these three main figures stand a pair of angels representing the angelic guardians of the four British Kingdoms, their four symbolic crosses at their feet. The Altar, artistically very much an integral part of the east end, is used at all main services, and is decorated with five panels surrounded by naturalistic foliage containing representations of the four Evangelists and a central panel depicting the Crown of Thorns surmounted by a royal crown. The Side Chapel lies to the liturgical north of the main altar. 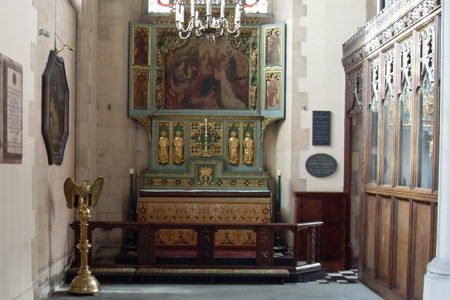 Here the screen and altar rails are carved by Lawrence Turner, following Bodley’s designs, as was the Flemish-style triptych with its central panel of the Adoration of the Magi. They were painted and gilded in 1956. The Organ was erected in the old church by Brindley and Foster of Sheffield in 1897 and rebuilt here. In 1958-9 the organ was rebuilt by Rushworth and Draper. The case was designed by CG Hare in 1908-9 and also built by Rattee and Kent of Cambridge. 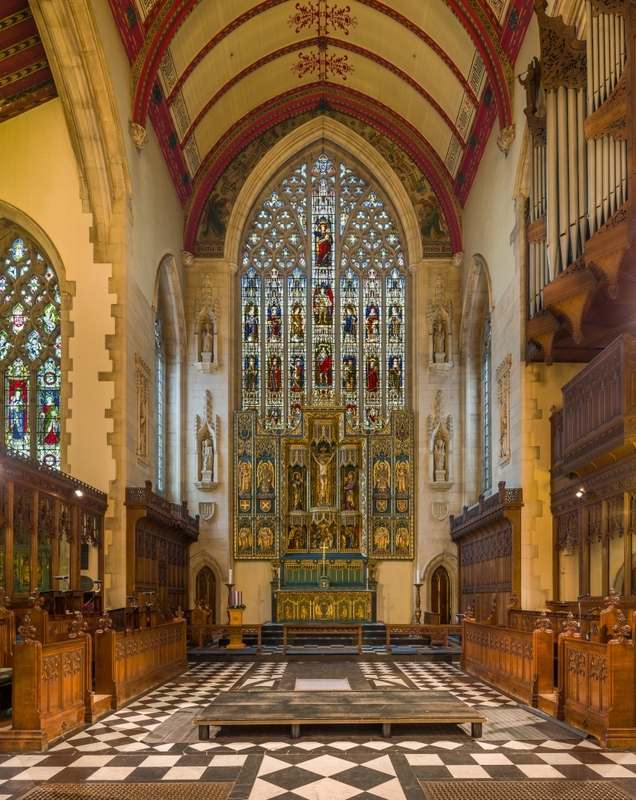 The magnificent acoustics provided by Bodley’s design enhance the organ’s performance. The Pulpit’s wineglass stem shape was designed by Bodley in 1904. It is decorated with the four Doctors of the church, St Ambrose, St Jerome, St Augustine of Hippo and St Gregory and the four evangelists. Its ornamental staircase has been described “as fine of its sort as any in England”. The painting and gilding of the pulpit only took place in 1964, when Douglas Cleverley Ford was Vicar. The Font in the southwest corner was designed by Bodley in 1902, but his design for a towering font cover was never realised. A smaller font cover designed by John Hayward and executed by Faithcraft was provided in 1962. The three Chandeliers, which create such an impression as one enters the Church were a gift of John Nicholas Fazakerley in 1909, and were erected in front of the altar, thus obscuring the reredos. They were moved to the centre of the church in 1989, when the church was rewired and extensive redecoration carried out. What was Bodley’s own scheme for illuminating the church and why these magnificent chandeliers were donated just two years after Bodley’s death are not known at this time. The Bodley Memorial lies to the left of the Lady Chapel It is made of red and white marble and was designed in the Jacobean style by Bodley’s pupil Edward Warren in 1910. The selection of this classical style in a Gothic church has been questioned, but the fact that this style was selected by someone close to Bodley suggests that the idea would have had his approval. The beauty of the architecture is elegantly complimented by a series of very fine stained glass window by Burlison & Grylls, who were responsible for all but one of the stained glass windows in the church. The tall seven-light ‘east’ window above the reredos was designed by Bodley and well executed by Burlison and Grylls, although its real northern exposure prevents the viewer from seeing at its best. The Side Chapel has two windows. In the ‘east’ window, the main light illustrates the Virgin and Child. To the left there is a crown of thorns, below which St Simon holding a saw. To the right a circle of thorns, below which St Jude holding a club. The nave and chancel of the church were consecrated on the Feast of SS Simon and Jude on the 28th October 1903, the side aisles and chapel on the same date 3 years later. The ‘north’ Lady Chapel window again features the Virgin and Child surrounded by five female saints. The ‘East’ window at the end of the ‘North’ aisle is to be found above the Bodley memorial. It features eight historical figures, called in the explanatory notes “English Worthies”; William of Wykeham, Sir Francis Drake, Sir Philip Sydney, Geoffrey Chaucer, Henry Purcell, Rahere, the founder of Bart’s Hospital, William Harvey and William Caxton.. The windows alongside the “North” aisle and the two “side” windows on the “West” wall are memorials to members of the congregation and of Holy Trinity’s first two Vicars, Henry Bartholomew Coward and James Owen Hannay, , who was also a novelist, writing under the pseudonym of George Birmingham. 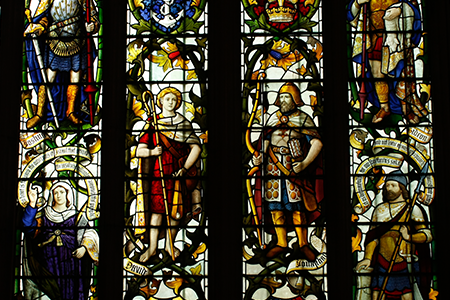 The Hannay window is the only one in the church not executed by Burlison and Grylls. The central “west” window of the nave is spectacular, designed and executed by Thomas Henry Grylls in a vigorous early Renaissance manner It is known as a war memorial, although there is no dedication in the glass to this effect. Its depictions of Old Testament heroes and warrior saints, the crests of the dominions of the Empire and a mighty army advancing form an almost visual depiction of the hymn “Onward, Christian Soldiers”. The scene at the top bears considerable resemblance to the Benozzo Gozzoli frescoes in the chapel in the Palazzo Medici-Ricardi in Florence. The brass lectern in the form of an eagle standing on a globe, which in turn is supported by an ornate pillar, supported by flying buttresses is well worth a look. At the present time there is no information as to the supplier or when it was installed in the church. In 2007, a large quantity of archive material was discovered tucked away in the church, unopened since, in some cases, the middle of the 19th century, relating to both Holy Trinity and All Saints churches. The following papers, drawing on this material, are also available on request, contact. Holy Trinity Church: how it came to be built – but very nearly didn’t! The Vicars of All Saints Ennismore Gardens – mad, bad and dangerous to know?